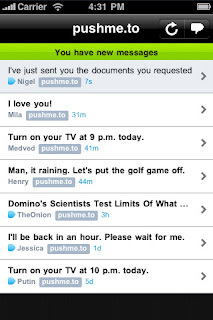 Pushme.to is an instant messaging service from web to iPhone/iPod Touch and between registered users. Pushme.to allows you to receive free instant messages from anyone, delivered like an sms, even if they don't have an iPhone. You can also use Pushme.to to send free instant messages to your friends with iPhones, without any per message or international charges. * typing your message at http://pushme.to/nickname. No registration is required for sending and it's free.